One medium being the extension of, or exhibiting a direct connection to, another medium is not a new concept. In fact, this concept of media convergence has been around for as long as multiple mediums have existed. In order to better understand the convergence or synergy that exists between cinema, in particular horror film, and theme parks, it is crucial to understand how we arrived at this point. One thing that film and themed entertainment both have in common is that each tells a story—in a different manner. But, the narrative is often quite similar. Prior to theme parks and cinema (film), there were plays, novels, and oral stories/traditions. 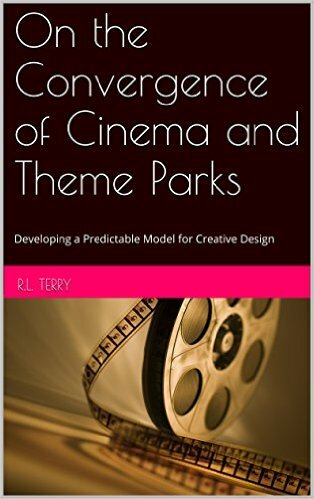 The novel is an extension of the oral story, the play is an extension of the novel, cinema is an extension of the play, and the theme park is an extension of cinema. According to Dr. Henry Jenkins, “there has been an alarming concentration of the ownership of mainstream commercial media, with a small handful of multinational media conglomerates dominating all sectors of the entertainment industry” (2004, p1). This is clearly seen in the acquisition, exhibition, and development of theme park attractions based upon movies and, to a lesser extent, television shows. The first cinemas were setup more like attractions than actual theatres. Perhaps more than coincidentally, theatres began springing up at the same time Coney Island opened its turnstiles around the beginning of the twentieth century; and at this time, cinema itself was still very much viewed as an attraction (Gunning, 1986). According to Tom Gunning (1986), “it was precisely the exhibitionist quality of turn-of-the-century popular art that made it attractive to the avant-garde” (1986, p66). So this concept of the convergence of cinema and theme park (or attraction) is one that dates all the way back to the early 1900s. Since some of the earliest films were of a surreal or horror nature, it is of no surprise that horror played a large role in the development of the cinema attraction. Much in the same way that early cinema was essentially a variety show, in essence, lacked a continuous diegesis, or narrative, the convergence of cinema and theme parks offers a variety of cinema-based attractions that are, indirectly at best, connected to each other. However, instead of the film, itself, being the attraction, cinema-based theme parks and attractions use the narrative provided by a work of cinema and uses elements of that film that can be translated into a real-world experience. But as with any media convergence, there are also pitfalls to such a synergy between two powerful media. In order to best understand the pitfalls and promises in such a meeting, it is imperative to discuss convergence of two media in and of itself. Understanding the concept of convergence will better prepare filmmakers and themed entertainment designers to select the best elements of films to translate into themed attractions based on movies, in particular horror or action. According to the leader of research into the area of media convergence Henry Jenkins (2004), “media convergence is more than simply a technological shift. Convergence alters the relationship between existing technologies, industries, markets, genres, and audiences. Convergence refers to a process, but not an endpoint” (P1). Over the years, the relationship between cinema and theme parks has shifted. Before, cinema was the attraction; and now, the attraction is infused with cinema. And the handful of multinational media conglomerates own both methods of the exhibition of creativity. With the exception of the Walt Disney Company, many of the other media conglomerates have prominent interests in theme parks and film and television studios; and some also have interests in Broadway productions (i.e. Universal Studios’ Wicked and Sony Pictures’ Spider-Man). Crossing over into new arenas of revenue requires access to vast media libraries, and that is what many of media conglomerates have at their disposal. This ability to converge areas of media interest in order to generate more revenue is something that contrasts with old Hollywood. Jenkins (2004) remarks that “old Hollywood focused on cinema, [and] the new media conglomerates have controlling interests across the entire entertainment industry” (P34). This convergence greatly influences the way society consumes media and entertainment (everything from movies to theme parks to music to toys and games). More than a cross-promotion of entertainment and media products, the convergence of cinema and theme parks is “a reconfiguration of media power and a reshaping of media aesthetics and economics” (Jenkins, 2004, P35). This reconfiguration comes in many shapes and forms. And, the horror film has found a place within the new configuration of entertainment media synergy. Specifically, the horror film has been used instrumentally in this reconfiguration; evidence of this can be seen in the prolific number of television shows (most popularly zombie shows), movies, and horror/Halloween themed events at theme parks (e.g. Busch Gardens’ Howl-O-Scream and Universal Studios’ Halloween Horror Nights). In these events, horror films provide a vast heritage from which theme parks can draw characters and plots to create temporary attractions to generate more income for the media company. Looking at many of the opening day attractions at movie-based theme parks, horror films were the first films to be translated into themed entertainment.